When people have birthdays, one of the main attractions is the cake. For most people, the days have passed when cakes were made at home for the celebration relying on store-bought specialties instead. Why join the masses and get a cake like that when you can get a personalized specialty custom birthday cake from a Selden bakery? Our New York Cakes bakery specializes in unique cakes and cupcakes that are perfect for any party. Themed parties are becoming especially popular, and aren’t just for kids anymore. Many adults choose to have a cake that reminds them of their childhood, particularly for such landmark events like 50th birthdays. Whether they choose a favorite Disney character or other childhood favorite, our expert decorators can handle the job. What better way to end your wedding day than with a gorgeous cake combining personal interests, elegance, and your wedding colors. Whether you are looking for a tiered option, or even a groom’s cake, we have just what you need. We have many different bride and groom statues to adorn the cake top, or can even create custom figurines to add a more unique touch. Our New York Cakes bakery is located in the heart of Suffolk county Long Island, making it very convenient to hundreds of venues in and around Long Island and New York City. This makes it extremely convenient to either get your cake delivered to the site, or make arrangements to pick it up. With dozens of scrumptious flavor combinations available, there is sure to be one to fit everybody’s taste buds. Please take a look around the site and you will find displays of our specialty New York cakes. We try to display a variety of cake samples including birthdays, weddings, and graduation cakes. While not displayed yet we also create many other types of cakes including anniversary cakes and holiday cakes. If you ever have a question about something you see or do not see on our site, please feel free to contact us for additional information. Also each month we have a contest where we raffle off a discount on one of our customized New York cakes. 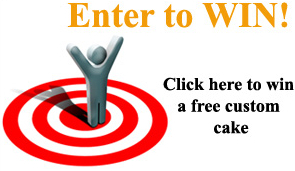 There is no obligation to purchase anything from us to enter the contest. Simply provide your contact information and tell us about your favorite cake. A new winner will be selected each month for the cake discount. Treat yourself to a taste of our specialty New York cakes. By choosing to bake with only the finest cake ingredients, we hope to deliver scrumptious desserts for any New York celebration. We strive to be one of the best specialty cakes and gourmet cupcake bakers in NYC and Long Island. As a result we offer expert decorated, delicious, and affordable cakes for any occasion. From whimsical to wedding cakes, choose Land of Cakes New York for your next event.